Water is continually moving through the environment – we call this the water cycle. Water evaporates from the oceans, condenses into clouds and then falls on the land surface as rain, only to flow into rivers and back into the sea. 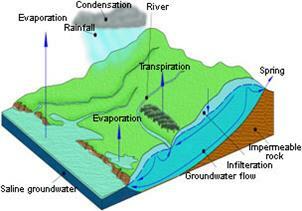 However, there is one aspect of the water cycle that is often forgotten – groundwater. Rainfall doesn’t only reach rivers by running off over the land surface. Most of the rainfall will soak into the soil, which acts like a giant sponge. In the soil some of the water will be taken up by plants and, through a process called transpiration, will return to the atmosphere, but some will soak further into the ground – a process called infiltration - and trickle downwards into the rocks, becoming groundwater. The level at which the rock becomes saturated is called the water table. Water in this saturated zone will flow from where it has infiltrated to a point of discharge. This might be a spring, a river or the sea. Much of the flow of a river will be made up of discharging groundwater, and groundwater provides a vital role supporting wetlands and stream flows. Water is present almost everywhere underground, but some geological formations are impermeable – meaning that water can hardly flow through them – and some are permeable – they contain fine holes that allow water to flow. Permeable formations that contain groundwater are known as aquifers. The holes that water flows through can be spaces between individual grains in a rock like sandstone, or they can be networks of fine cracks. Very occasionally groundwater will flow in underground rivers, but this is the exception rather than the rule.